Have you seen the weather forecast for today?! 23 degrees in London! This is officially the first HOT day of the year (if you’re reading this and don’t live in the UK, this is pretty exciting news!). There are so many reasons to celebrate the sun finally giving us some heat (and a great excuse to sunbathe) but of course it can be pretty scary when we first bare our skin that probably hasn’t seen daylight since August last year. So after months of hibernation, our skin needs just a little love and attention before we bare all. 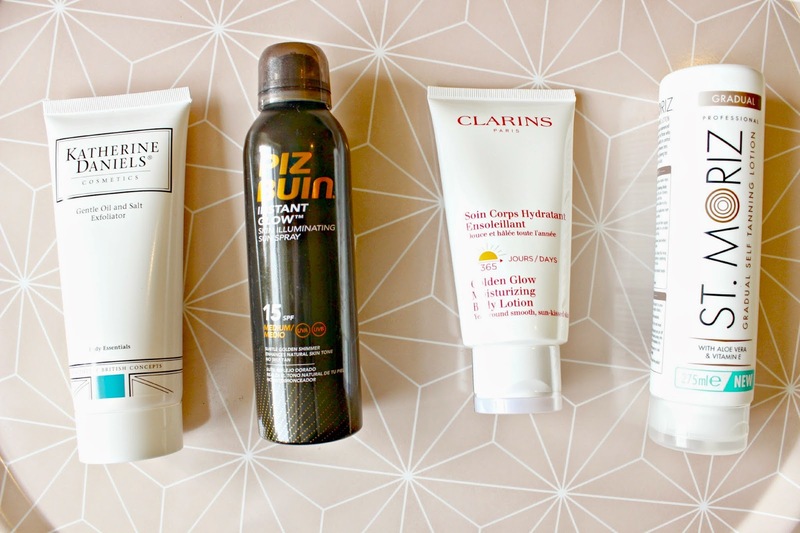 So, here are some products that I recommend you check out to get a bit of a glow before you hit the rays, and also a new launch from Piz Buin which will have your skin looking fabulously glowing, and protected. First, it’s important to create a smooth base for any potential tan, real or fake! So for this, you want to use a non-drying exfoliator to get rid of any dead skin cells. An exfoliator which I find particularly invigorating is the Gentle Oil & Salt Exfoliator from Katherine Daniels which you scrub away on dry skin before rinsing away in the shower. Thanks to the oils, your skin feels nourished instead of dry afterwards – plus it smells gorgeous! A more luxurious option is the Clarins Golden Glow Moisturising Lotion. I’ve been loving pretty much everything from Clarins recently, and this product not only gives a beautiful natural tan, but also, the pigments within the lotion minimise small imperfections in your skin, giving a subtle airbrush effect. It’s also filled with vitamins so your skin glows – it’s so lovely! I use this on the lead up to special occasions like a holiday or wedding. Finally, a product for you to wear outside, when you want to get a real tan safely. The Piz Buin Instant Glow doesn’t contain any self tanning agents, but similar to the Clarins lotion, it contains pigments which give your skin a flawless glow, which makes it far easier to bare all on that first day of sunbathing! Whether at home or abroad, applying the Instant Glow Skin Illuminating Sun Spray gives your skin a very subtle golden shimmer with the light reflecting pearls within the spray. Your natural skin tone is oh-so-subtly illuminated and best of all, it’s also protected. Piz Buin of course delivers UVA and UVB protection immediately upon application and it’s sweat and water resistant. Also, is anyone else a little bit obsessed with the smell of Piz Buin products?!! Are you Preparing to Bare now that the sun is out?